As an SLP, we live and breathe vocabulary! It is the basis of it all, right? Without words, communication would have little meaning – it doesn’t matter if the words are spoken, pictured, signed, gestured, or produced through a voice output device. They are foundational to acquiring language – both written and oral. 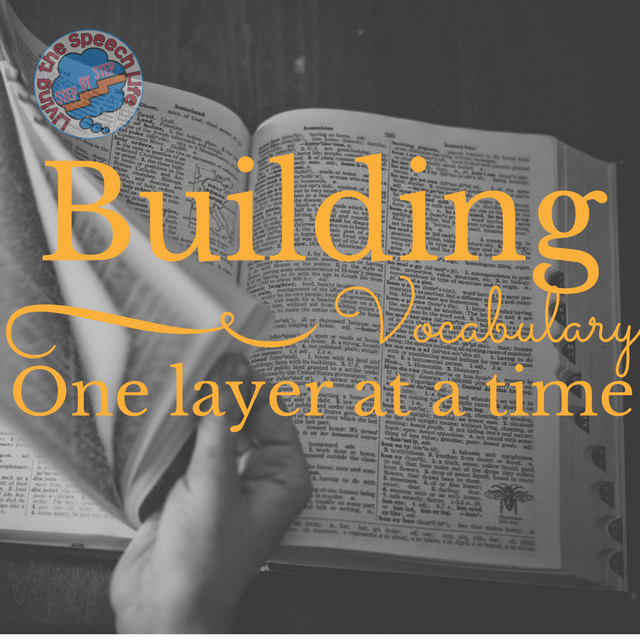 Increasing vocabulary is a HUGE part of the daily life of school-based SLPs. It can be overwhelming at times, especially when we think about the sheer number of words students are exposed to and expected to learn in a school year. Or the amount of repetitions needed to learn them all. The words we choose to focus on are as important as the therapeutic methods and strategies we use. There should definitely be nothing random about it. Relying only on spelling lists or vocabulary lists from the teachers’ lesson plans just won’t cut it. But where should we begin? Core vocabulary is a small set of words (250-350) that are simple, and are common in any context. These words are familiar and frequent including all parts of speech and most have six or fewer letters. In any age group, core vocabulary makes up 80% or more of the words we use in daily conversation. WOW! These make up the first words and phrases of toddlers and continue through adult conversations. Working with students using AAC? What about students who are minimally verbal or have low cognitive ability? Teaching high frequency core vocabulary is the way to go! Praactical AAC has monthly lists and tips for instruction including suggested books to increase practice! Just type ‘core vocabulary’ in the search box and away you go! When choosing words to teach beyond the core, it is helpful to consider the three tiers of vocabulary as discussed in the second edition of Bringing Words to Life by Beck, McKeown, and Kucan. Their article on Reading Rockets summarizes it nicely. Tier One is made up of basic words that typically are learned without instruction. These words include sight words and basic nouns and verbs – and core vocabulary too. We definitely work with individuals who need to build their Tier One vocabulary, don’t we?!? Tier Three words are low frequency and usually learned specific to content or context. If these are the words we focus on, will our students be able to converse with anyone about anything? Probably not where we should focus our energy and all-too-valuable time! Tier Two words, however, are the words to know! These are highly frequent in literature and conversations among adults. They are invaluable for reading comprehension and generalize across environments. These words have multiple meanings and can help increase descriptive language. Comment below and tell us how you choose which words to teach. Follow us as we continue the vocabulary conversation. Future posts will further discuss teaching vocabulary concepts and strategies, tools for identifying Tier 2 words, breaking down prerequisite skills and writing measurable vocabulary goals.